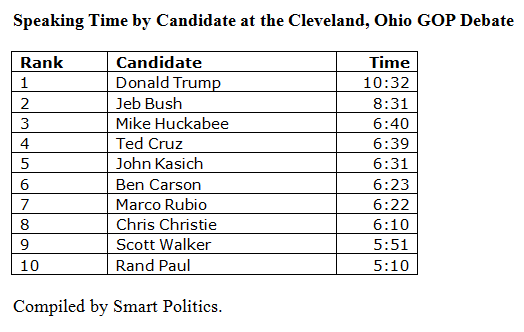 As explained and predicted in a Smart Politics report published on Wednesday, Donald Trump received the most face time at Thursday’s presidential debate in Cleveland. 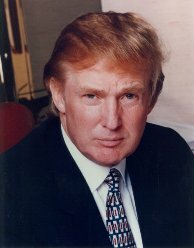 Trump, who has surged to the top of national and many state polls, is the early frontrunner of the large field and, as such, received a clear plurality of the speaking time afforded to the 10 candidates to make his case to the American public. The New York businessman had the microphone for 10 minutes and 32 seconds, with a high profile start out of the gate as the only candidate who would not pledge to support the GOP nominee or not run a third party campaign this cycle. Following Trump was Jeb Bush who is currently in second place in national polling. The former two-term Florida governor logged in eight minutes and 31 seconds. With the 10 candidates speaking for a total of one hour, eight minutes, and 49 seconds, an equal distribution of speaking time would have been six minutes and 52 seconds per candidate. However, Trump and Bush were the only two candidates who reached (and exceeded) that mark. In third was former Arkansas Governor Mike Huckabee at 6:40 followed by Texas U.S. Senator Ted Cruz (6:39), Ohio Governor John Kasich (6:31), retired neurosurgeon Ben Carson (6:23), Florida U.S. Senator Marco Rubio (6:22), New Jersey Governor Chris Christie (6:10), Wisconsin Governor Scott Walker (5:51), and Kentucky U.S. Senator Rand Paul (5:10). In other words, Trump spoke for more than twice as long as Senator Paul. Governor Walker’s short speaking time was largely of his own doing. Despite candidates frequently being given at least one full minute to speak, Walker gave responses of less than 40 seconds six times and never exceeded 48 seconds for any of his remarks. The FOX moderators, meanwhile, spoke for 31 minutes and 53 seconds, or 31.7 percent of the broadcast. 6 Comments on "Tale of the Tape at the GOP Debate"
The RNC and FOX are so scared of Trump that they not only rigged the debate rules, their talking heads spent most of their time trying to undermine him wherever and whenever they could. And he still won, as the Drudge poll showed. I would like to know if you made the time comparisons on the earlier debate. I thought that was even worse with the moderators eating up all the time. This happens no matter who hosts. These media kings and queens make it more about them with their gotcha questions than it is about the candidates. I would like to know how many questions each candidate was asked. It seemed some were asked more than others. I usually like Megan, Chris and Bret. However, I felt they were trying to make Trump look as bad as possible. Some of the questions for the governors were about talking points they have answered many times before so prepared. Not too fair. I thought Rubio did well. Also, was surprised to like Huckabee & Carson. Do you have the breakdown in time for each moderator? I am curious to know if one of them dominated the time. I agree with Pete that the moderators insert themselves too much in the process. While it is important to know how well the candidates can handle gotcha questions, I am more interested in the candidates’ positions on important issues and their policy proposals to address them. FOX tried their best to hush Rand Paul. They even censor him out of their polls. So ridiculous; he’s the best candidate and doesn’t get to show it.